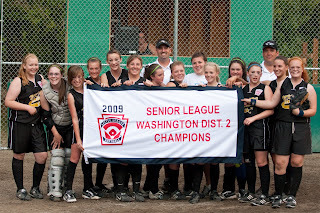 The Knutsen Family: 2009 NK District 2 Softball Champs!!! Scott has been coaching Taylor's softball team for about 9 years now. In the 9 years they have only won 1 game once they reached the district playoffs. This year we were hoping for a different outcome. Boy did our wish come true!!! We had an amazing group of girls that came together and played exceptionally well. It was so exciting to see them succeed in their game after their weeks and weeks of practice. Although we didn't do as well as we would have like to once we made it to State, the girls all had a great time and walked away satisfied with their District win....this year! 8th grade dance. She looks like her mamma!